Graduate School of Public Health colleagues Stewart Anderson, professor in the Department of Biostatistics (left) and Marlon Jones, senior data manager with NRG Oncology, have been volunteering together for years at Christmas Day at Pitt. More than 150 people from Pitt and the University’s dining service offer meals to individuals and families in need. Staff and faculty also donate gifts for children and gift bags of cold weather essentials. 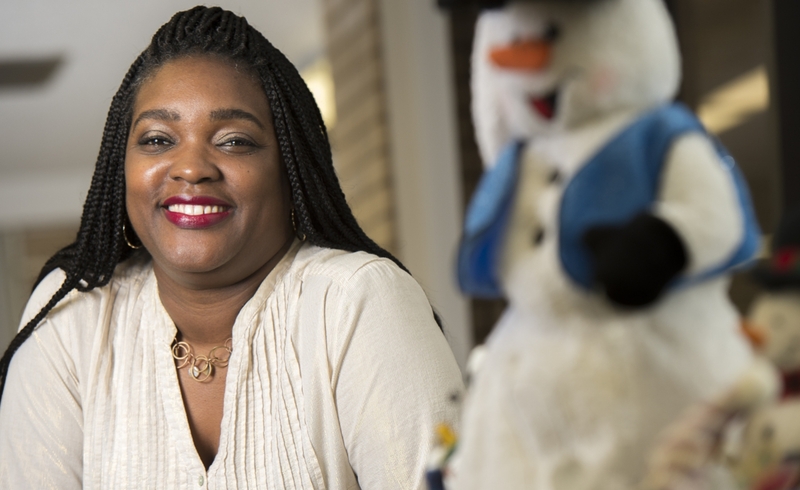 LaShawn Youngblood, receptionist in the Kenneth P. Dietrich School of Arts and Sciences’ chemistry department, is an 11-year volunteer at the annual Christmas Day at Pitt. More than 150 people from Pitt and the University’s dining service offer meals to individuals and families in need. Staff and faculty also donate gifts for children and gift bags of cold weather essentials. Senthil Natarajan, a software engineer in Computing Services and Systems Development, began volunteering for the Christmas Day at Pitt celebration when he joined Pitt a dozen years ago. More than 150 people from Pitt and the University’s dining service offer meals to individuals and families in need. Staff and faculty also donate gifts for children and gift bags of cold weather essentials. 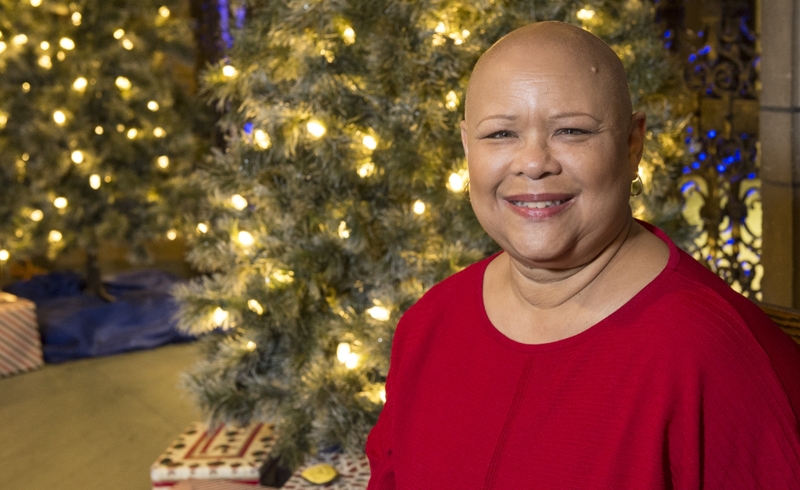 Camille Burgess, assistant director of student services and MBA programs for the Joesph M. Katz Graduate School of Business, brings 15 members of her family from three generations when she volunteers for Christmas Day at Pitt. More than 150 people from Pitt and the University’s dining service offer meals to individuals and families in need. Staff and faculty also donate gifts for children and gift bags of cold weather essentials. Nanju Besagarahalli, systems analyst with Computing Services and Systems Development, began bringing his daughter Sonya, then age 10, along to Christmas Day at Pitt when he started at Pitt in 2006. She still comes, now 22 years old and a Pitt alumna. At the event, more than 150 people from Pitt and the University’s dining service offer meals to individuals and families in need. Staff and faculty also donate gifts for children and gift bags of cold weather essentials. LaShawn Youngblood knows the true meaning of Christmas Day at Pitt. The deadline to register to volunteer for Christmas Day at Pitt is Dec. 15. Click to see opportunities and available shifts. Volunteers must be at least 10 years old. Share joy this season by adding just one gift for a child in need to your holiday shopping list. Community and Governmental Relations’ holiday gift drive is taking place now through Wednesday, Dec. 13, and gifts will be distributed at the Christmas Day at Pitt event. Details of the gift drive are available in the University Times. Youngblood, receptionist in the Kenneth P. Dietrich School of Arts and Sciences’ chemistry department, is an 11-year volunteer for the annual Christmas Day at Pitt event, where more than 150 people from Pitt and Sodexo Campus Services, the University’s dining service, offer 2,500 Christmas meals to individuals and families in need, in addition to students who aren’t leaving campus during the winter break. Pitt staff and faculty also donate more than 500 holiday gifts for children and 1,000 gift bags filled with winter hats, gloves and other cold weather essentials. This year’s event will be held on Dec. 25 in Litchfield Towers’ Market Central, from 8:30 a.m. to 4:30 p.m.
Youngblood particularly enjoys joining members of several Pitt athletic teams, who help in advance of Christmas Day, wrapping gifts donated by members of the Pitt community. She’s says that she’s done nearly every job at the event through the years, from greeting people coming through the doors to giving out desserts and cleaning tables. Besides, she added, working at Pitt “is not just a job. Volunteering is something that we want to do. When you want to do something, people can feel it. The event began a dozen years ago, said John M. Wilds, assistant vice chancellor for community relations in the Office of Community and Governmental Relations, which organizes the event. The Salvation Army, which had run the event from several downtown Pittsburgh hotels, asked Pitt to take over part of its long-running Christmas mission of providing meals on that day, and the University added toy and winter clothing drives to offer gifts to attendees. 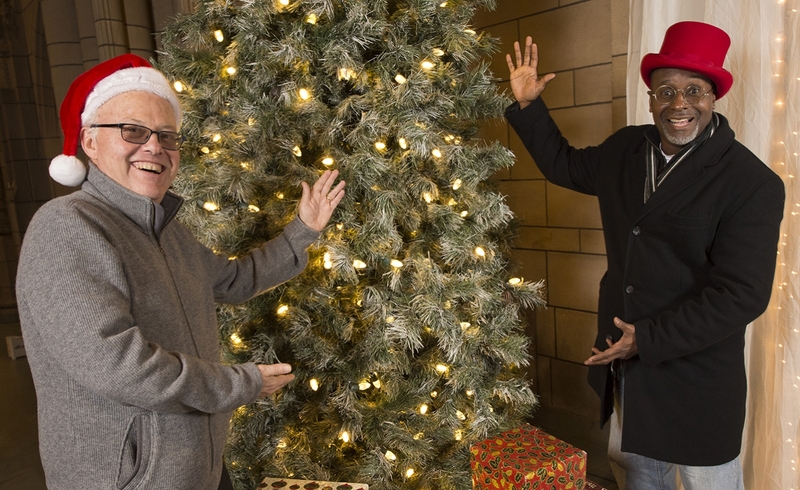 Long-time volunteers come to Christmas Day at Pitt in teams and in pairs, such as Graduate School of Public Health colleagues Marlon Jones and Stewart Anderson, who have been volunteering together for many years. Jones, senior data manager with NRG Oncology, is headed for his eighth year volunteering. “I don’t know anywhere else in the city of Pittsburgh that does this to the extent they do, from the food to the entertainment,” he said, recalling the Salvation Army and other bands that play Christmas carols on site. Jones said that he usually lingers past his shift, just to keep soaking up the atmosphere. 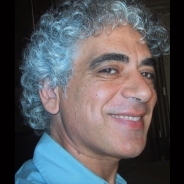 Stewart, a professor in the Department of Biostatistics, was first attracted to the event simply because he missed Christmas after he converted to Judaism 30 years ago. “It was a way of celebrating and a way to give to people,” from serving eggnog to preparing the silverware and napkins each year. Camille Burgess, assistant director of student services and MBA programs for the Joesph M. Katz Graduate School of Business, brings 15 members of her family from three generations when she volunteers. The family has participated all 12 years at Pitt — and ever since the original event sponsored by the Salvation Army downtown, many years before. She remembers seeing her late nephew Peter, on pain medication for sickle cell anemia, still serving each Dec. 25th. “Peter would stand out there and smile and ask, ‘How are you doing?’ In spite of his own challenges he never hesitated to come. Senthil Natarajan, a software engineer in Computing Services and Systems Development, began volunteering for the Christmas Day celebration when he joined Pitt a dozen years ago. Sometimes, he added, it may be hard for an individual to contribute money to charitable causes, no matter how important the cause may be. “But at least I can be a part of this and contribute a little bit of time to make people happy,” he said. “It’s a commitment to myself. As long as I am here I will try to do this." 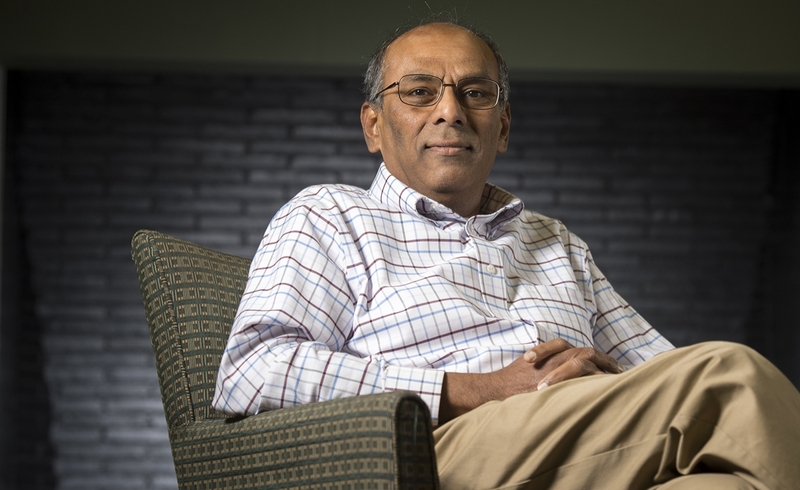 Nanju Besagarahalli, systems analyst also with Computing Services and Systems Development, began bringing his daughter Sonya, then age 10, when he started at Pitt in 2006. She still comes, now 22 years old and a Pitt alumna. Besagarahalli said it's a great honor for him and his daughter to help. “I know we are blessed, but at the same time we like to share with as many people as possible, make their holidays a pleasure, so they should have a feeling that they are not ignored,” he said.